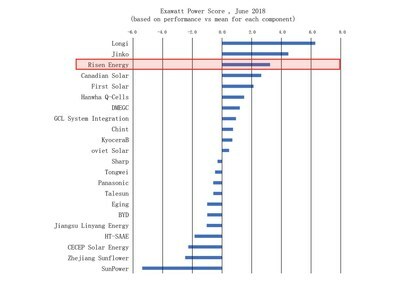 – NINGBO, China, Nov. 19, 2018 /PRNewswire/ — With its industry-leading PV module technology and growing capacity, Risen Energy found itself among the top three solar PV module manufacturers in the Exawatt Power Rankings for the second quarter of 2018. This achievement demonstrates Risen Energy’s outstanding success in technology and professional project services. Risen Energy attributes its strong competitiveness in the Chinese solar PV sector to the company’s continuous commitment to R&D and innovation. The company recently rolled out nine new product lines, with a special focus on half-cut cell modules, with its black polycrystalline silicon, general monocrystalline and PERC monocrystalline half-cut cell modules recently going into mass production. Thanks to improvements in the R&D and technology of solar cells and modules, the company has expanded its patent portfolio and achieved record conversion efficiency, with conversion efficiencies of monocrystalline cells, polycrystalline cells, monocrystalline modules and polycrystalline modules exceeding 23 per cent, 21.1 per cent, 20.4 per cent and 19.4 per cent, respectively. The attenuation ratio of these products is less than 2.5 per cent in the first year, rising only to 19.2 per cent after 30 years.